Draw Manga expression surprise. Learn how to draw a Manga character expression of surprise. In this tutorial you will learn how to draw emotion or expression in Manga that are commonly known as surprise. It is very common for Manga artists exaggerate their characters expressions because in line drawing you have to make it larger than life. In drawing character emotion, unlike real life, it is difficult if you make it too subtle. This drawing of a girl expresses surprise or shock, draw the whole eyes really huge but make the pupils smaller. This is particularly apparent in Manga face, when a character is so suprised or chock that his/her eyes become almost as large as the rest of the face. In this particular example, I also make her mouth wide with her teeth clenching together. It is an extreme example of showing the shock or surprise effect. 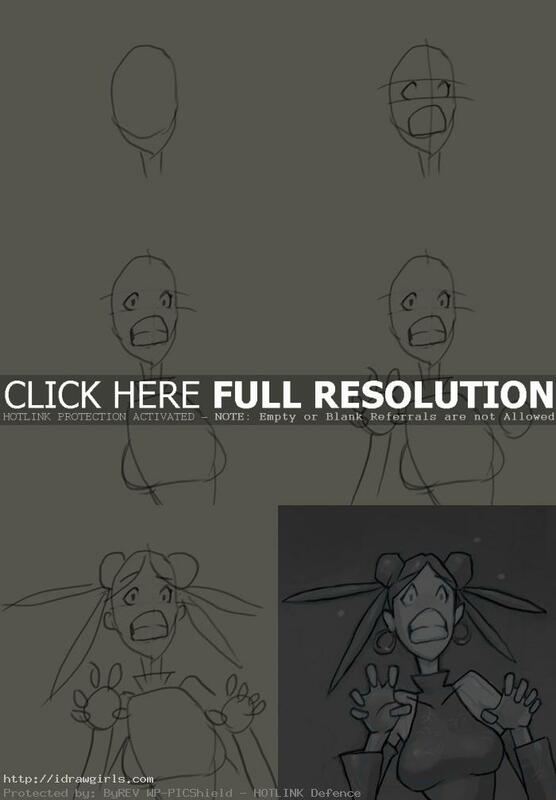 Below are step by step tutorial how to draw Manga surprise expression. Step one, I set up simple oval shape and simple lines for her neck. Step two, I measure her face with horizontal and vertical line, then I drew her eyes and mouth. Step three, I erase the measure lines then add pupils, teeth and drew basic shape for her upper body. Step four, I drew her hand, some shapes to indicate her fingers, and forearm. Step five, then I added her shoulder, upper arm and her chest. Step six, I clean up the rough sketch and make it more clean and appealing. More Manga and Anime drawing tutorials.